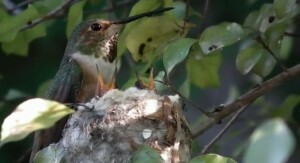 An Allen’s adult female hummingbird feeding her two five day old babies. The babies hatched January 22nd & 23rd, 2012 in San Juan Capistrano, South Orange County, CA. Her nest was built in a Pittosporum outside near the kitchen window. The two 11 day old Allen’s babies eyes are open now and really pushing up their heads to get fed. Watch the progress of the San Juan Capistrano hummingbird nestlings. 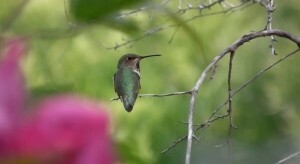 Mama hummingbird is very busy all day long keeping them fed. Sometimes 20 minutes before she returns to the nest. Adult female Allen’s hummingbird in San Juan Capistrano backyard. Keep a few bear branches left for perching in your garden and yard. Birds love to have a place to perch to take in the view.